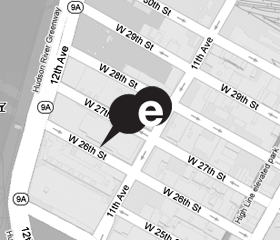 Founded in the early 1990s in New York City, the Matthew Marks Gallery is one of the world’s most influential gallery spaces for international contemporary artists. The gallery represents over twenty-five American and European artists of different generations and has four locations in the heart of Chelsea, with more than 15,000 square feet of exhibition space, and a notable new building in Los Angeles with a façade enhanced with a site-specific Ellsworth Kelly sculpture. The gallery is known for representing both established figures like Ellsworth Kelly and Jasper Johns and younger artists like Nayland Blake, Nan Goldin, and Darren Almond. Matthew Marks was one of the pioneers in the Chelsea district and is known for its deep commitment to its artists. They wanted a state-of-the-art website with an elegant and intelligent design that would reflect both the vibrant contemporary side of the gallery and the established 20th-century masters as well. They also needed an efficient interface that would allow them to easily update website content. They knew their old site was in need of an overhaul; artist information was hard to find, search engine ranking was poor, and managing the site was cumbersome. The new website features a beautifully spare and intuitive design. Our goal was to make everything easily accessible to the user. The clean look has the appearance of simplicity, but in fact the website is deceptively robust—it is rich with content and features, including e-commerce, downloadable PDF press packets for each artist, links to museum exhibitions (both present and past) for gallery artists, and links to private rooms. The architecture of the website achieves a new level in gallery website design. The first thing you see when you arrive at the site is a large image announcing the current exhibition against a black background, with the website menu arranged horizontally at the top of the screen. 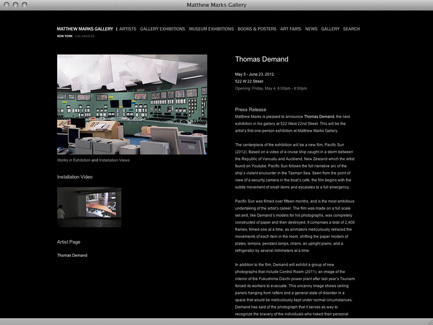 The screen transitions to a new image every three seconds or so, revealing other current Matthew Marks exhibitions at the gallery’s various locations. 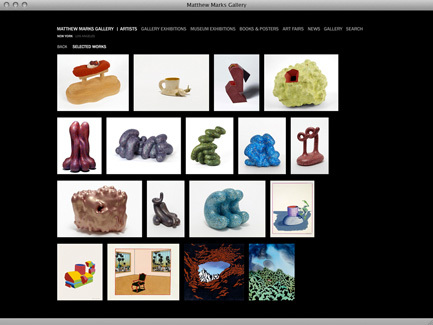 The website can facilitate up to eight current exhibitions on the opening page. Clicking on one of these thumbnails takes you to the exhibition page, where you find information about the artist and the exhibition on the right half of the page, with a clickable image filling the left half of the page. Click on this image (or the button below it) and you’re taken to a screen full of large thumbnails, each an image of artwork from the exhibition immaculately framed with a white border. Click on one of these, and an eye-popping image of the artwork fills the screen, again framed attractively in a white border against the black background. Here the black background becomes an active element exploiting the white border and activating the space around the artworks with an irresistible clarity. It’s a beautiful device for displaying artwork on the Web. As you move from page to page, the menu bar is always displayed at the top of the page, allowing for easy navigation wherever you go in the site. Another navigational aid is available when you are viewing full-sized images: near the top of the screen, just below the left side of the menu bar, are three simple directional arrows which enable you to move backward or forward one image at a time, or jump one layer up the menu to the thumbnail page. Also on the exhibition page is a button taking you to another corridor in the site, this one devoted to the artist and his body of work. The organizational structure for this section gives the gallery the ability to share a generous amount of information about the artists. Here you will find selected images of the artist’s work; biographical information about the artist and a brief description of his work; the artist’s exhibition history; links to publications available for purchase; links to press packets (in PDF format); and links to current and past museum exhibitions for the artist. 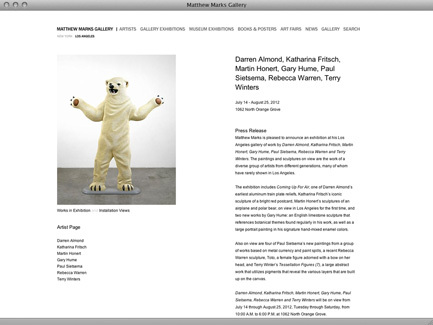 The artist’s previous Matthew Marks Gallery exhibitions are also archived here, with full-page images of the artworks available for viewing. The menu bar gives you the choice to navigate by “Artist” or “Current Exhibitions.” Another menu choice lets you view a list of museum exhibitions featuring artists represented by Matthew Marks; there are links here to the museum websites, where images of artworks and descriptions of the exhibitions can be found. Customers can click on the “Books & Posters” menu option to view a gorgeous display of items available for purchase directly from the gallery. The site is fully set up for e-commerce. 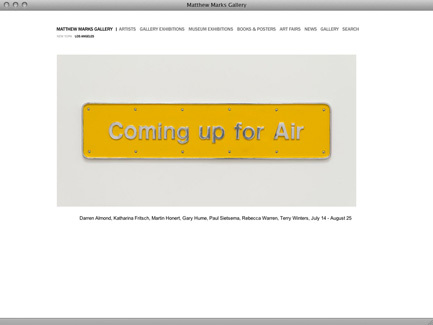 It should come as no surprise that Matthew Marks, an active promoter of art fairs, would include a menu button taking you to information about art fairs where the work of the gallery’s artists are represented (“Art Fair Installation Views”). Another menu option takes you to news about the gallery and its artists. A fun and interesting feature here is a tab called “Diary,” which takes you behind the scenes for a more intimate look at gallery artists, events, installations, and interviews. This area also includes content from years past. In addition, there is an option here to view video content in the form of links to YouTube files; the site supports custom Flash video as well. The decision to embed video or use Flash video is up to the gallery, depending on its need. 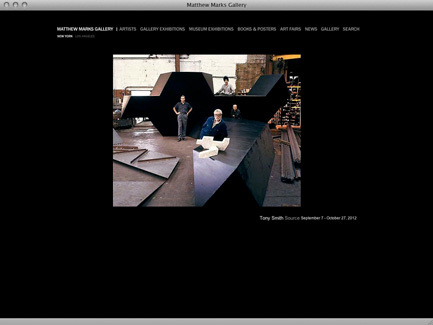 But this special feature, developed especially for the Matthew Marks Gallery website, is a capability most gallery websites don’t have. The menu also includes a search tool, which sorts results logically by artist, exhibitions, and books. 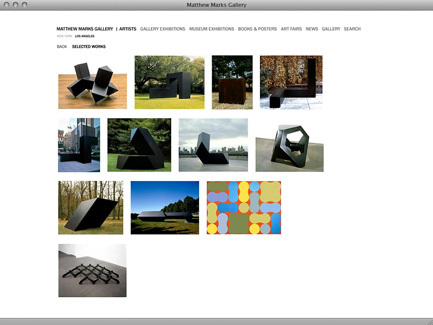 The Matthew Marks website is driven by a powerful back-end. The site is entirely managed by gallery staff via a simple-to-use, intuitive Web interface. The result is a totally integrated gallery solution, with an elegant public interface and a refined back-end interface that makes the day-to-day maintenance of the site easy for the gallery staff. The clean look has the appearance of simplicity, but in fact the website is deceptively robust.